It’s freebie time again! Inspired by Will Lion‘s excellent “mind bites” series of desktop wallpapers, I started putting together a series of A3 size posters for my classroom wall. 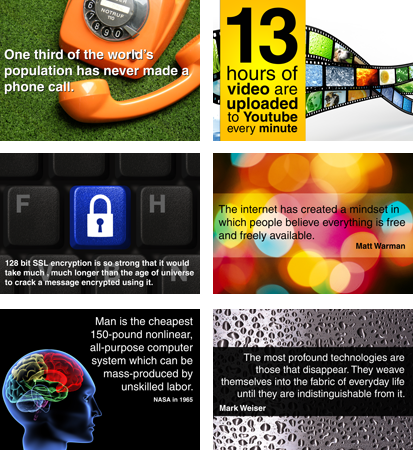 These posters include quotes, facts & figures relating to the impact of ICT on society so should make for good display fodder in computer suites. If there is no citation for images, it’s because they’re from licensed stock collections, or they’re mine. The entire collection (of 17 posters at the time of writing) weighs in at around 145mb with each file being 300 DPI A3 size. I haven’t finished yet, and I’m more than happy to hear suggestions for posters you’d like to see – just add them in the comments at the bottom of the post. Download the entire collection as a zip file (192mb). More free-to-download posters are available based on TED talk quotes here. Great posters – I’ll try and think of some others! Thanks for the heads up – I’m uploading them to this server now. I’ll update the post when it’s done. Just come across your posters. They look great. Have downloaded them to print off and display in school. I have just found you from a Google search. Thank you for sharing your resources, they’re fab! I am an NQT starting at a new school in September and definately want to put some of these up in my room! Great Posters! Just what I need to brighten up my new classroom. Thank u very much for sharing these posters….it’s really precious….I’m going to use them on our school ICT week. Great stuff…keep it up….waiting for some more posters….!! !